If you have visited my blog or read any of my posts before then I am sure that you will be well aware that I have a very unhealthy concealer addiction. I don’t know what it is, but as soon as I discover a new concealer, I have to buy it and try it out almost immediately. So naturally, when I saw this Nars Radiant Creamy Concealer and I saw how much people seemed to love it, I had to try it out for myself. There was so much hype around this concealer and if all of the claims were true about it, I was sure that it was going to be my new favourite. I have been trailing this for a couple of months now and I am finally ready to write this review for you guys. Even though I have wanted to try this Nars Radiant Creamy Concealer for such a long time, I decided to wait a while and try and check some other cheaper things out. I feel like at the minute I am spending an arm and a leg on makeup and I am trying to curb that expensive habit. I tried some supposed dupes for this product like the Maybelline Fit Me Concealer and I did like it, but I think that just made me want to try the Nars Concealer even more. In the end, I quickly caved and logged onto the House of Fraser website and ended up buying the Radiant Creamy concealer in the shade Custard. To start with, I want to talk about the thing that I always talk about when it comes to reviews and that is the packaging. This Nars Concealer comes in a tube with a wand for application, like many other concealers on the market. I think that the packaging is lovely and sleek, and it does live up to the high price tag of the product. I will say that the packaging is similar to the Maybelline Fit Me Concealer with the kind of tube that it is in, but it just feels much more luxurious and, in a sense, more expensive. I also like that it has a doe-foot applicator because it is quick, easy to use and it feels nice on the skin. I think that the shade range that Nars have in this concealer is just wonderful and I know that there are plans to extend the line even further. They cater to some of the lightest skin tones as well as some of the most beautiful deep shades. I have the shade Custard in this with is a light-yellow tone, which is incredibly for highlighting with. I am also planning on buying another that is a closer match to my foundation shade so that I can conceal areas around my face and blemishes with this concealer. I think that I can quite confidently say that if you wanted to buy this concealer you would be able to find your shade. 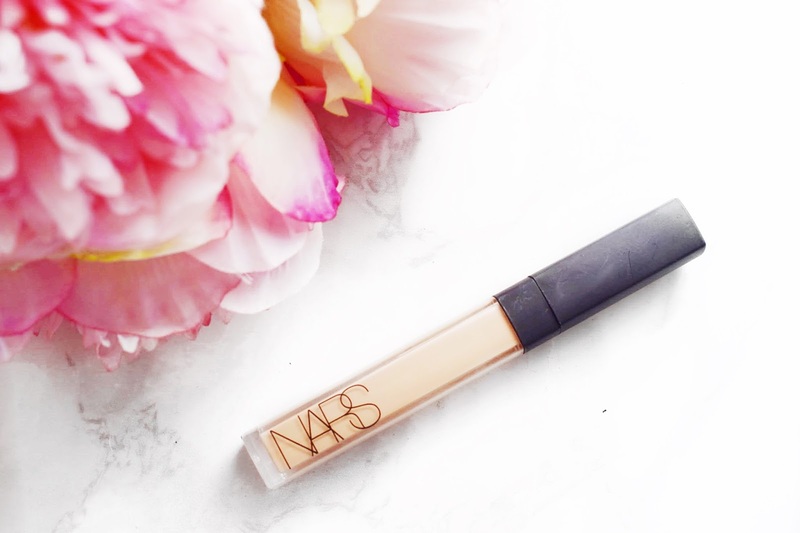 The consistency of this Nars Radiant Creamy Concealer is stunning and as the name suggests it is beautiful and creamy when you apply it to the skin. I like to go in with a really generous amount around my face and then I take my damp Beauty Blender and I push it into the skin and it looks so seamless and beautiful within an instant. I have paired this concealer with so many different foundations and I feel like it works well with everything that I use it with and it always blends in like an absolute dream. For this reason alone, it has become one of my favourite concealers from my collection. The coverage that this concealer gives is very beautiful and full. The main area where I apply this where I have issues that I want to cover is underneath my eyes and when it is blended out, it covers everything absolutely perfectly. The good thing about this is because it is that because it is so pigmented, you only need a small amount to get a lovely full coverage look. Even my deepest areas of darkness around my eyes can be covered with this Nars Radiant Creamy Concealer. The only thing about this concealer that I would change given the chance is that I wish the wand picked up more product as you bring it out of the tube. Whenever I reach for this and use it, I feel like I have to dip into the tube so many times to get the right amount of product. With products like the Tarte Shape Tape or Urban Decay Naked Weightless Concealer, I feel like they pick up the perfect amount of product to do the whole face without having to dip back into the tube. I am sure from reading this review that you can already tell that I am in love with this Nars Radiant Creamy Concealer and I really enjoy reaching for it. The coverage is second to none, it blends into the skin like a dream and the shade range is just perfection. This has quickly become my most used concealer and I know that I am going to be reaching for it hell of a lot. I will leave a link to this down below in case you want to check it out for yourself. Make sure to leave me a comment and let me know if you have tried this product and tell me what you thought about it! A marketing executive and fully trained makeup artist, with an unhealthy obsession for designer handbags and shoes! Can usually be found online shopping with a glass of prosecco in my hand.